A coalition of activists from groups all over Chicago have come together to plan a week of action between May 17, International Day Against Homophobia, and May 22, Harvey Milk Day. We want to educate and motivate people in Chicago to fight for full federal equality for LGBTQ people. Check out our schedule! Need more information? Email ChicagoMilkWeek@gmail.com for more information. 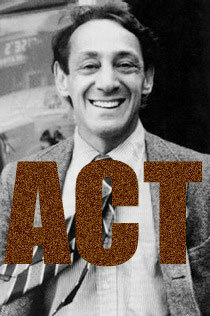 Other cities are planning similar efforts — check out Equality Across America’s nationwide Harvey Milk Day call to action. Comments : Comments Off on Get Involved! Sign The Petition; More Events! The ENDA13 appreciate all the support yesterday — thanks to all those who made calls to Sen. Durbin, those who came to the flashmob outside and got labeled a second class citizen, and those who spread the word about our action and signed the petition. Here is the link to our petition, which includes the pledge we wanted Sen. Durbin to sign. If you haven’t already, please sign it and pass it on! Meanwhile, we still have two days left of Milk Week! Tonight at 6 you can attend CJR’s Engagement Reception on the south side or LGBT Change’s Legal Networking event on the north. Either way: please join us tonight for Queer Noise at 8 PM at New Wave Coffee. And tomorrow we rally and march! Meet us at 1 PM at Michigan and Congress. Bring your signs and rainbow flags! Full details on the Schedule page. Comments : Comments Off on Sign The Petition; More Events! Today, Thursday May 20th, is our flashmob to demand immediate passage of the Employment Non Discrimination Act, with gender identity provisions intact. The flashmob, a piece of political street theater, will begin promptly at noon, outside the federal building at 230 S Dearborn, and will involve bringing a copy of our call to action to Senator Richard Durbin. Many people may ask, “Why target Senator Durbin? After all, he is a co-sponsor of ENDA.” Although we’re very glad our Senator has co-sponsored the bill, we have seen him do precious little else to support it. As the Majority Whip of the Senate, the second highest ranking Democrat in the Senate, we need Senator Durbin to stand before the media and his colleagues and forcefully advocate for this bill’s immediate passage. THIS IS AN EMERGENCY. Our community needs ENDA now because we face disproportionate workplace harrassment, unemployment and poverty. (Read the call to action for specific numbers.) And although the vast majority of the public agrees that no one should be fired for being LGBTQ, the Democrats are dragging their feet on following through with their promises and passing ENDA. If they wait too long, most agree that the bill will have NO CHANCE to pass this election cycle! The LGBTQ community has stepped up to the plate and done our part. We gave votes, money, and countless hours of volunteer work to elect a Democratic majority in both houses of Congress and a put a Democrat in the White House. We have lobbied our representatives and educated the public. We were told to wait until after the health care bill passed, and it has passed. We did our work, NOW CONGRESS MUST DO THEIRS. We ask Senator Durbin to fight for his constituents by getting this bill into law. Comments : Comments Off on Flashmob TODAY! There are great events planned for tonight — and don’t forget about tomorrow’s FLASH MOB to demand the inclusive Employment Non Discrimination Act. Noon, Federal Plaza, be there. 7:00pm – Gender JUST will host a teach in about their Chicago Public Schools campaign and direct action. Gender JUST is grassroots organization of Lesbian, Gay, Bi-sexual, Transgender, Queer, and Allied (LGBTQA) people organizing through a racial, economic, and gender justice framework. Location: 810 N. Milwaukee. 7:00-9:00pm – LGBT Change Organizing Meeting. Please join LGBT Change for our first community organizing meeting to get involved in what we are doing and help shape the future of our community outreach. We want to hear your ideas and also tell you about who we are and how you can get active. Location is Munroe Hall, 2312 N Clifton Ave – DePaul’s Lincoln Park Campus. Check us out online and friend us on facebook. You can also RSVP for the meeting on Facebook. We hope to see you there! Make sure to attend tonight’s events! 5:30 PM – Protest opposing anti-LGBT hate in Uganda, Kenya and Malawi. Meet in front of Millennium Park, corner of Monroe Street and Michigan Avenue. Sponsored by Gay Liberation Network. 7:00-9:00 PM – Film screening of Fish Out Of Water, a documentary that explores the impassioned relationship between homosexuality and the Bible. The hour-long film will be followed by a discussion with the director, Ky Dicken. Sponsored by LGBT Change and All Saints’ Episcopal. 4550 N. Hermitage. You can make both if you drive or cab it… or by public transit if you leave the IDAHO protest at 6:18: Google Maps Public Transit Route. This event is a couple days before we intended the Week of Action to start, but when we found out about it we couldn’t resist adding it to our calendar! Saturday, May 15, 3:00 PM – Great Global Kiss-In. In celebration of the International Day Against Homophobia, groups nationwide are having kiss-ins. RSVP to the Chicago kiss-in on Facebook, which was organized by an individual activist. Location is near the Cloud Gate sculpture (“the Bean”) in Milennium Park. Friday night’s Queer Noise open mic night with host Cameron Esposito is going to be an amazing show. If you like to sing, play an instrument, perform a spoken word piece, juggle, mime, read a poem, or rock the musical saw, we hope you’ll come show us your talent. Even if you sign up ahead of time, please still check in the evening of the show by the time the show starts, so we know you’re there.